What Is The Science Behind E-Bikes? When you hear the words ‘electric bike’ you may start picturing a motorcycle or sedentary gym bike, but that is not what an electric bike is. Electric bikes are actually very similar to regular bikes and, they both have many of the same parts as a regular bike and they both operate in much the same way. The only difference is that electric bikes have extra electric components which allows the bike to assist you up hills, through difficult terrain and whenever you need extra power. Electric bikes will give you extra power which can assist you with difficult tasks, but they will normally still require some effort on your part. Electric bikes can also be used in the same way as a manual bike if you do not use the electric components or if the bike has run out of power. Electric bikes will be heavier than a regular bike as they have extra electrical parts which contribute to their overall weight, so if you use an electric bike without harnessing its electric components you can get a pretty intense workout. So how do electric bikes actually work? There are different types of electric bikes available and these bikes will run a little differently depending on their design, but all electric bikes will need batteries and an electric motor in order to function. Electric bikes are not a new idea, in fact, electric bikes were documented as early as the 1890s. These early electric bikes were propelled by an electric motor, but they obviously did not use the torque sensors and power controls which we have today. These components were developed a century later in the 1990s and as a result, electric bikes became quite popular during the early 21st century. These bikes proved particularly popular in China and mainland Europe. Electric bikes run on battery power. Electric bikes are normally powered by Lithium-ion batteries as these batteries are generally seen as better quality and tend to be more popular than other options, but you may also come across NiCadSLA and NiMH batteries. In order to charge your bike, you will just need to plug the battery into an electricity socket and weight for it to fully charge. More expensive high-end batteries may take as little as two hours to fully charge, but lower-end batteries may take up to eight hours. You will normally have a few options depending on how much effort you want to put into your bike ride. The motor is one of the most important parts of an electric bike as this is what will add extra power to your ride. The power comes through the motor and the motor can be found in the front, middle or rear of the bike. Front motors can be found in the bikes front tire and they help to spin the tire. When you ride a front motored bike you will feel like you are being pulled forward and it will take some of the excess pressure off you so you can enjoy cycling for longer. Bikes with a rear motor will have the motor located in the back tire. This will create the sensation that you are being pushed forwards. Some people prefer this sensation to the feeling of being ‘pulled’, but it all depends on your personal preference. Mid-motors are powered by the bike’s drivetrain which is located in the middle of the bike. Thanks to the motors central location these types of bikes can make the cycling process easier whilst still maintaining a natural riding sensation. Electric bikes are designed to make your cycling easier by adding its own power to your motion. Some bikes will include a torque sensor which can measure how hard you are pedalling and then add proportionate power to help you along. Some bikes will allow you to control the level of power by a volume dial which you can use to select the amount of power that you want. They may well have a ‘throttle mode’ similar to how a motorbike is operated. The throttle will be on the handlebars and will allow you to control the motor. This throttle may either be controlled with a twist throttle (similar to the motorbike throttle) or a thumb throttle which allows you to control the power via your thumb rather than your whole hand. Other bikes may include a rotation sensor which can tell when you are pedalling and it will add the same amount of power no matter how fast or slow you pedal. The former option is obviously more sophisticated because it will adjust its power to your output, whereas the latter will give you the same power no matter what your output is. There are quite a few different electric bikes which may give you no extra power at all or they may basically move the bike for you so you don’t have to put in much effort at all. Your options will include the following. This function means that the bike is being propelled by the rider only and it works just the same as a normal bike. You can use any electric bike like this if the battery is dead or if you choose not to harness the electrical components. Keep in mind that electric bikes are heavier than regular bikes and will be harder to ride in manual mode. This function will activate the motor when you start pedalling. You will still get a workout, but the motor will take some of the pressure off so you can ride for longer without getting as tired out. You may also be able to control how much or how little assistance the electric motor gives you so you can push yourself and then rely more on the motor when you get tired out. This option will make the bike power itself via the motor so you will only have to put in a tiny amount of effort in order to ride the bike. This option will drain the battery faster, but it will certainly make things easier. Remember that any e-bike which goes beyond the 15.5 mph limit cannot be used without the extra insurance, a license and tax which you would have to pay for a motorbike. You may have noticed a number of commuters whizzing past you lately without even breaking a sweat and wondered ‘what am I doing wrong?!’. Don’t worry – it’s not that you’re horrendously unfit – the likelihood is that they were riding an electric bike. 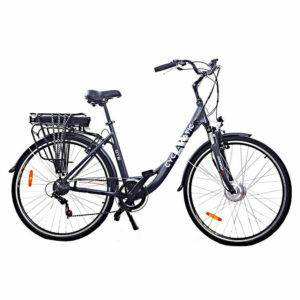 Electric bikes, also referred to as e-bikes, come fitted with a battery powered electric motor which propels the bike forward as you pedal, meaning that you can reach top speeds with ease. E-bikes may look pretty much the same as regular push bikes, but they have some key differences. 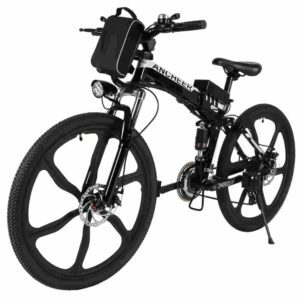 Through the use of a rechargeable battery, a drivetrain, and a motor located at either the front or rear hub or on the middle of the bike, e-bikes use electric power to drive the rider forward. Usually, the rider can choose whether to power the bike by pedalling only, or by pedal assist, where the motor kicks in to give a helping hand. On some higher-powered bikes there is an option to travel using the electric power only with no need to pedal. E-bikes come in varying forms, each of which comes with its own set of capabilities and legal restrictions. First, we’ll take a look at pedal-assisted bikes, also known as pedelecs. The motor on e-bikes with pedal-assist is regulated by the rider’s pedalling. This works through the use of a sensor which can detect the speed of the bike so that the motor can be automatically disabled when a certain level is reached, leaving the rider to solely pedal the bike until their speed drops. Although the majority of this type of e-bike is classified as a bicycle, some higher spec models may exceed this classification depending on their power output and maximum speed. On the other side of the spectrum are “power-on-demand” bikes, in which the motor is activated by a throttle in much the same way as a moped or scooter. Some of these bikes come fitted with pedal-assist whereas others can be motor-powered without any need for pedalling on the rider’s part. 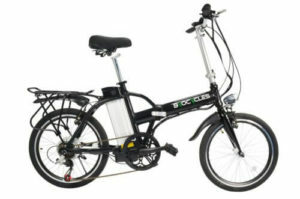 E-bikes vary widely in their capabilities. From small, low-powered motors which simply give a little boost to the cyclist’s pedal power to more powerful machines more akin to mopeds. The key difference between a high-powered e-bike and a motorbike is its ability to be pedalled. The majority of e-bikes are capable of travelling at a speed of between 15-20 miles per hour, with their range usually defined by the legal limits of the country they are sold in. For example, in the UK the legal speed limit for electric bikes in 15.5 miles per hour, and as a result the majority of e-bikes cut out when they reach this speed. The batteries can be charged by simply plugging into any power supply, such as a wall outlet. They can take anywhere between 2 to 8 hours to charge fully depending on their quality. Higher-powered e-bikes can travel at greater speeds, some reaching up to and beyond 28 miles per hour. Battery power can typically last anywhere between 20 and 60 miles per charge on pedal assist mode. How Do They Differ from Mopeds? In the UK, government regulations are clear on what counts as an e-bike, or an ‘electrically assisted pedal cycle’ (EAPC) as they like to call it. The first point is somewhat obvious: an EAPC must have pedals which propel it forward. Then it gets down to the nitty gritty: an EAPC must not have a power output of any more than 250 watts. In addition, the motor must only be able to function up to the legal speed limit for e-bikes of 15.5 miles per hour, after which it must automatically cut out leaving the rider to pedal. To ride an EAPC, you do not require a licence, insurance or registration. You are also permitted to ride anywhere that a normal bike is p ermitted, including bike paths and lanes. If an electric bike exceeds these standards, then it will legally be considered as being in the same category as a moped or motorbike. Some more powerful e-bikes come with a throttle function, whereby the rider can press a button or twist the handlebar in order to get an added boost without any need for pedal power. These would generally fall into this category, meaning that they are not permitted on normal cycle paths and they need to be taxed and registered. On top of this, the rider would also be required to carry a licence and wear a helmet when riding. When it comes to the environment, e-bikes are generally good news. They are encouraging many people to ditch their petrol-powered mopeds and motorcycles in favour of this greener method of travel. When compared to normal push bikes, e-bikes are obviously not quite so green. However, e-bikes do allow users to travel distances that may not be feasible by push bike, meaning that in such cases they are usually replacing more environmentally damaging vehicles such as cars and mopeds. Nothing is perfect, and the environmental issues with e-bikes come down to the damaging effects of disposing of lithium-ion batteries when they break. Cheaper batteries tend to have a lifespan of 300-700 charges, whereas higher quality ones can last between 700-1000 charges. The second problem comes with finding clean energy to charge the battery with. 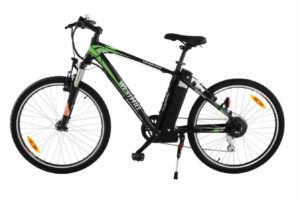 Nevertheless, e-bikes are a step in the right direction, and certainly preferable to using petrol-powered vehicles. Is It Time to Buy an E-Bike? Electric bikes can be incredibly useful for those who are living in a very hilly area, as they can provide the push needed to ascend those steep inclines. Likewise, they are a handy way for those less able to cycle to get back on two-wheels, such as the elderly, or those suffering with breathing or joint problems. If you fall into either of these categories and have the money to buy an e-bike, then it’s certainly worth the investment. For those who are seeking to ditch their car on their commute, e-bikes can also be a great option. In the long run, you can stand to save copious amounts of money on petrol, parking and road tax, whilst at the same time you can gain some exercise on your way to work and help do your part for the environment. When selecting your e-bike, just be careful to check that its specifications fall within the legal limits if you intend to use it out on the roads.